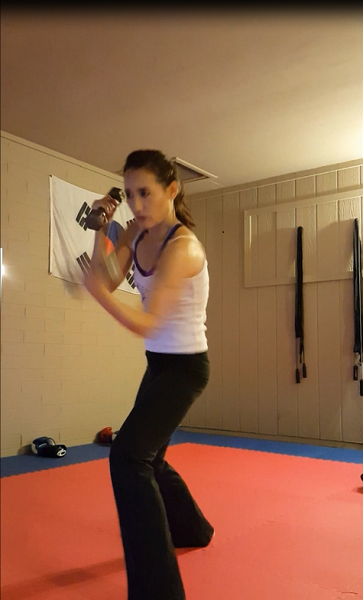 Martial arts fitness workout in the garage! This is something of a New Year’s resolution update post. I said I’d work on strength-training this year. I haven’t started lifting weights yet, but my garage workouts have involved body-weight strength-training – so does Body Combat, for that matter – and that counts! 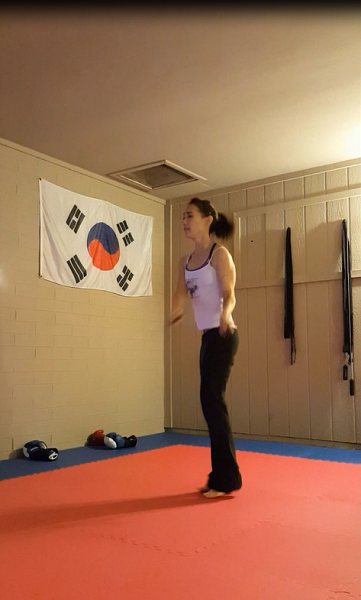 I’m going to post training updates regularly to share with any of you who might be interested, and also as a way of holding myself accountable for my resolution. I found this worked well last year when I made my resolution to go cruelty-free with my cosmetic and personal care products. 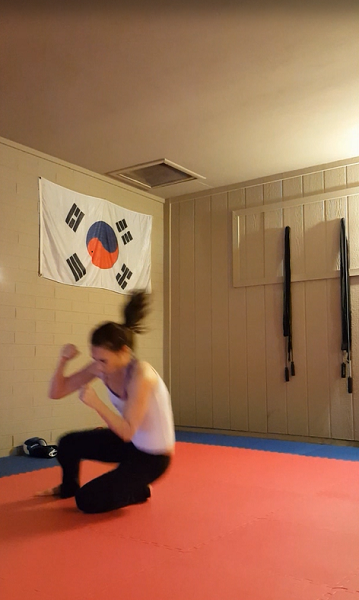 On that note, as I did with my Tae Kwan Do post a couple of weeks ago, I filmed parts of my last garage workout so I could clip some pics! 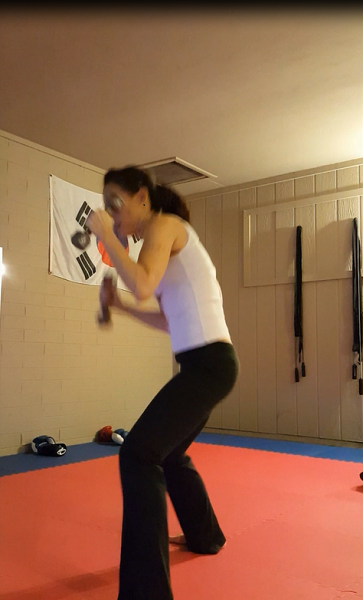 My workout on Sunday morning consisted of the sort of general fitness workout I enjoy the most, which is conditioning geared toward martial arts. The strength-training aspect is significant in these kinds of workouts, though I just realized that the pics I chose don’t reflect that part as much. Go figure. 1). I got started later than I’d wanted on Sunday morning, so I didn’t have breakfast. I had a Larabar and called it good. The simple fruit and nut combination did the job, but I would normally fuel up on something more substantial, and something containing whole grains. Eat substantially several hours beforehand, or eat something light 30-60 minutes before starting. I feel most energized when I have some combination of protein and complex carbohydrates (i.e. peanut butter on a slice of whole-grain bread) about an hour before working out. 2). Stretching was one of the things I did that I didn’t film. It’s important to stretch! Stretch at the beginning of your workout, but don’t stretch without warming up your muscles first. At least jog in place for 5-10 minutes before stretching. 3). You don’t see me drinking water in these pics, either, but I drink water periodically during my training sessions, usually between rounds/exercises. Hydrate regularly throughout your workout, but don’t overdo it. Just a swallow or two of water at a time will suffice. 4). 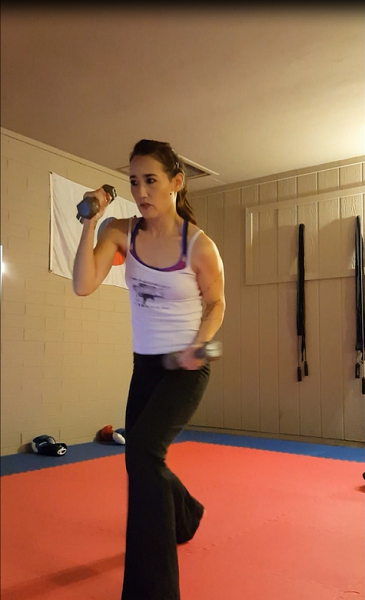 I incorporated some punching into my abs workout, and, as per usual for me, I didn’t wrap my hands or wear gloves of any kind. This is NOT advisable. Wear gloves or at least hand-wraps when punching things. For several reasons, I usually go bare-knuckled when training in the garage. Do not follow my lead here. Protect your hands with wraps and/or gloves (either boxing or MMA) if your knuckles are going to be making contact with solid objects. Cardio. 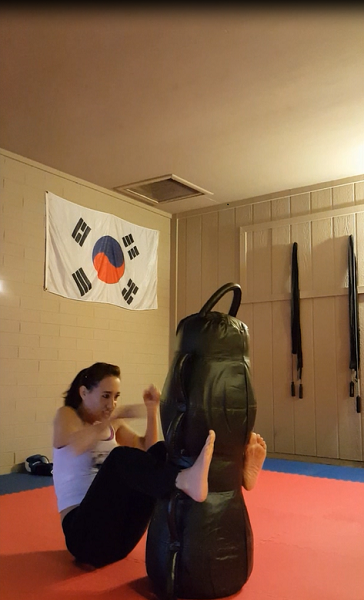 I don’t know what these are called… you hold onto the top of the bag and take quick, continuous, alternating hops, tapping the base of the bag with the ball of your foot each time. It’s like doing the leg part of mountain-climbers, but standing. 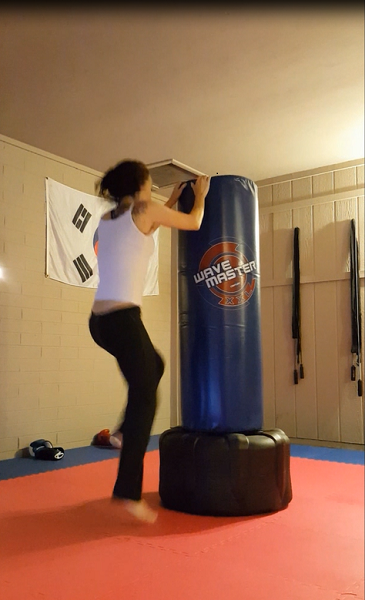 100 alternating foot hop-ups (or whatever you call them) on the standing bag. 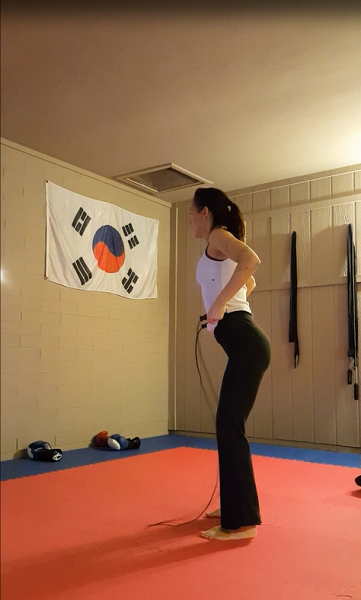 I like to start a workout with a few rounds of jump rope. 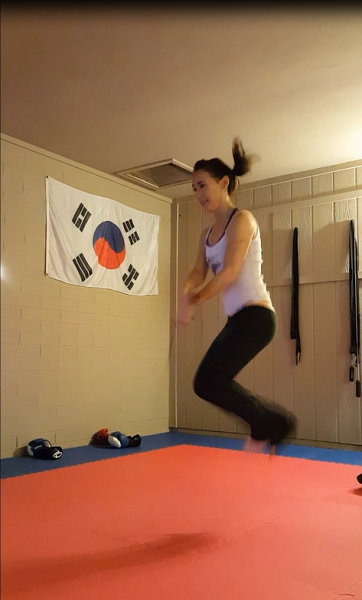 You can’t see the jump rope as I’m jumping, but it’s there. Jump ropes in motion are the ghosts of workout equipment. They can’t be photographed. Cross-overs with high jumps to mix things up. 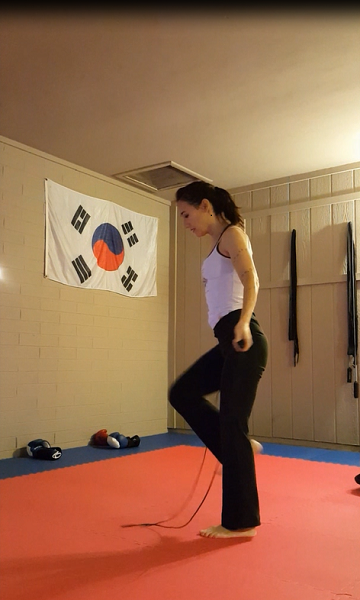 A jump rope is a fantastic piece of training equipment. Jumping rope conditions the entire body, and you can bring a jump rope anywhere and jump anywhere. Just make sure to wear pants that don’t fall down. 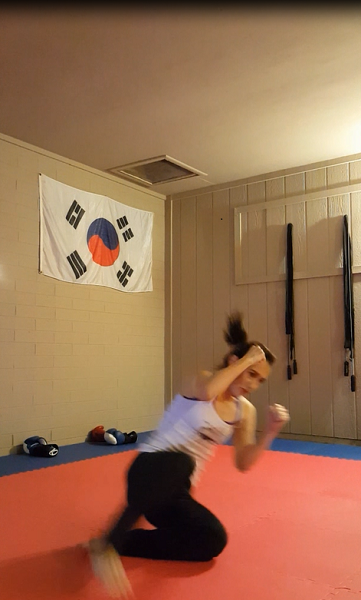 I practice front and back rolls because they’re fun and they help you to learn how to fall in martial arts situations. Always roll on a padded floor! Here I’m doing what I’d said wouldn’t suffice for my strength-training goals – shadow-boxing with weights. It’s actually great if I do it regularly as a component of a complete workout. These are five-pound dumbbells. Abs! I usually do these toward the end of my workout. This is great core work. 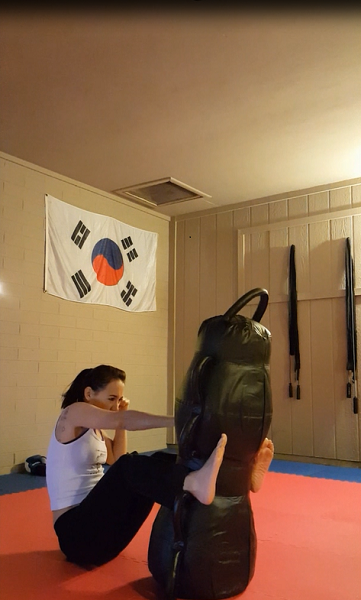 Hold the bag in place with your ankles, crunch up, and punch the bag diagonally to the opposite side. Lower yourself down, crunch up again, and punch with the other arm to the other side. You can do these without a bag, too. The important part is the twisting to punch diagonally across your body at the top of the crunch, as that works your obliques. Using your ankles to stabilize something like this bag works your lower abdominal muscles. You can make this exercise harder by ditching the bag (have someone hold your feet, or hook your feet under something stable) and holding a medicine ball or a dumbbell as you crunch up. Thrust the medicine ball or dumbbell diagonally across your body at the top of the crunch. Alternate sides and do as many as you can. To make it even harder, do it without someone holding your feet. In any case, your abs and obliques will hate you the next day, which is what you want. Don’t forget to keep your non-punching hand up! 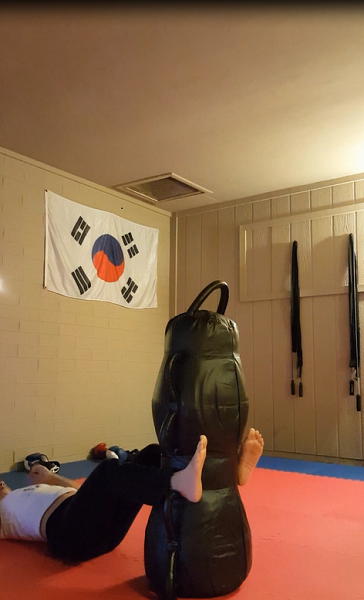 Bonus exercise when you’re done with your abs: Plant your foot on the MMA dummy, forcefully kick it down, and immediately jump on it to get in some ground-and-pound! ← “Beasts of No Nation” and The Oscars should have collided, but they did not, and I can’t believe it.